Kenya’s 2010 constitution, and subsequent Public Finance Management Act, introduced a new structure of government that puts citizen participation at the core. 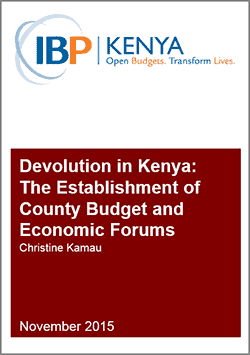 County Budget and Economic Forums (CBEFs) have emerged as a key institution intended to facilitate public engagement in budgets and economic development at the county level. Despite being a legal requirement, not all counties have established a CBEF. Those that have are still grappling with the structure, functions, and how to support the forum, as well as their relationship with the county governments and County Assemblies. This paper presents the findings of research conducted in four counties that are among those that have established a CBEF: Kericho, Kisumu, Kwale and Taita Taveta. It aims to gather emerging lessons, document challenges that the CBEFs and the county governments in the four areas have encountered, and capture how these challenges have been managed. It also provides a set of recommendations for improving their operations that is relevant for all Kenyan counties.